Did you know that they sell quick bread box mixes in grocery stores!? I think that’s so strange. Fake flour, loads of sugar, and ultra dehydrated blueberries in a box to be mixed with water and eggs. This concerns me… deeply. Exactly how quick does a quick bread have to be to make it in this world? I think homemade quick breads are dreamy. With enough creativity and guts, you can throw just about anything into a quick bread and call it delicious. This go around I tried zucchini and sweet potato. 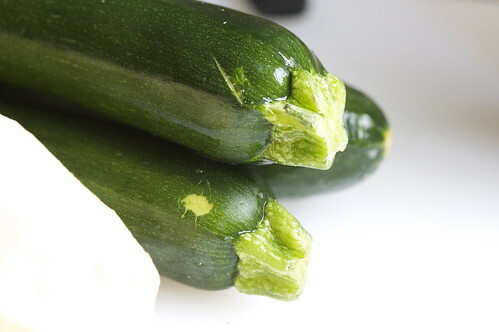 The combination produced a full and unique flavor: not too heavy on the zucchini or sweet potato flavors. 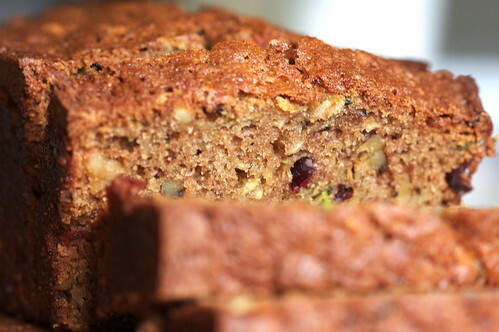 And of course, because I’m me, I also loaded the bread with spices, nuts and cranberries. You can modify if to your taste, I make room for that in the recipe. Because, yes, I care. What’s your favorite kind of quick bread? If you say the boxed kind, I swear, I’ll scream. Preheat oven to 350 degrees F. Butter and flour a 9x5x3- inch loaf pan and set aside. Sift the first 7 ingredients into a medium sized bowl. In a seperate, large bowl, beat the sugar, oil, eggs and vanilla extract. Mix in the zucchini and sweet potato. Add the dry ingredients and stir just to combine. Fold in the nuts and cranberries and stir well. Transfer batter to prepared pan. Bake until wooden pick inserted in center comes out clean, about 1 hour and 20 minutes. Cool bread in pan on a rack for 15 minutes. Loosen the edges of the bread with a butter knife and turn out on a rack to cool completely. Can be prepared 1 day in advance. Wrap in foil and keep at room temperature. Brilynn- I know, the grated sweet potato sounded totally weird to me too! But it really worked out wonderfully! Hilary- I think here in the US people generally eat quick breads for breakfast, with coffee or tea. They’re not really a dessert item, although they often taste as sweet and delicious as a dessert. 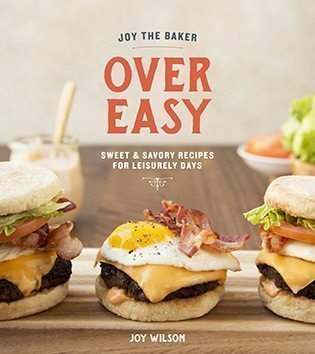 Breakfast or afternoon snack- that’s what I think quick breads are great for! I’m Australian and we don’t really have a tradition of quick breads here. This might be a weird question – but when do people typically eat these breads? Are they essentially a cake? Do you have them for dessert? Or are they more the kind of thing you toast and have with tea? 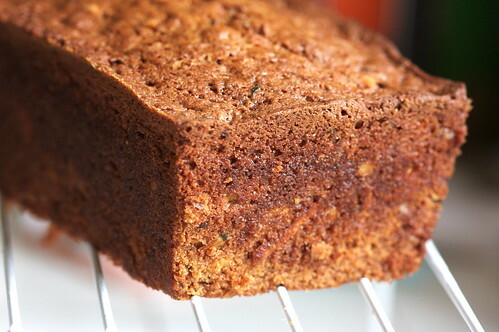 I have never had zucchini sweet potato bread, but after seeing yours I wish I had a slice right now! 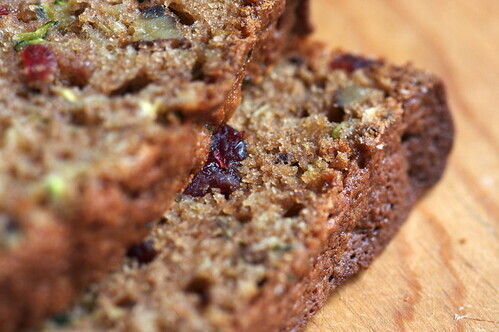 I love zucchini bread, so I bet I’d love this one too! Mmmm… I hadn’t thought of sweet potato. Yum! I wouldn’t have thought to grate in the sweet potato! Come summer though, there will be lots of zucchini around my place to eat. Haven’t been to your site in a while, and man! I’ve been missing so much! I hardly knew which post to comment on first, but I figured I’d just comment on the first to say everything looks awesome, including this zucchini bread. Yum! I can’t wait to try this! I’ve been wanting a good zucchini bread recipe….this looks perfectly wonderful! I’m trying a strawberry and rhubarb quick bread this weekend…if it’s half as good as this looks, I will be in heaven! 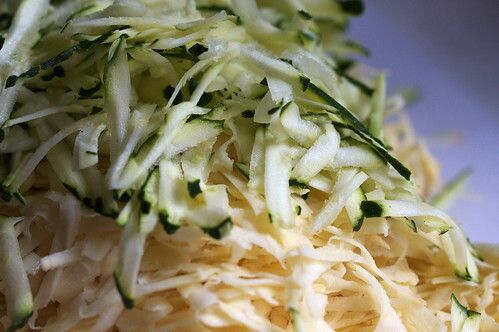 Really luscious looking – the zuccini factor always gives it that moist, rich flavor. Sweet potato – hmmm… interesting idea. It looks amazing. This looks wonderful! Such an interesting but delicious-looking combination of flavors. I am totally with you on the homemade quickbread. I think that boxed breads are quite sad :) I am usually a fan of banana bread, but I really want to try this recipe next time I made quickbread! Yum, sounds great. I love making sweet potato bread, and I love zucchini bread – it only makes sense that I would love a bread that combines the two!